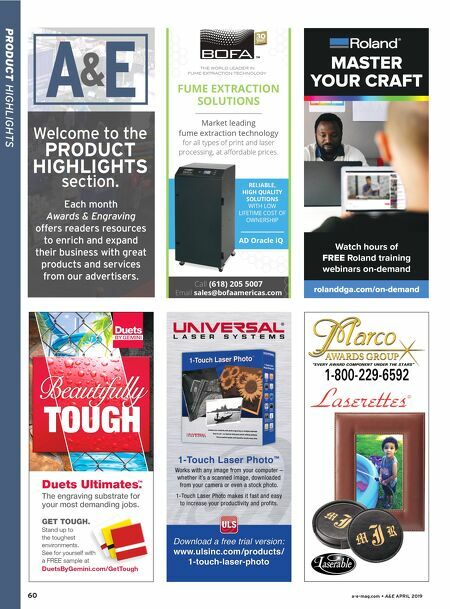 PRODUCT HIGHLIGHTS 60 a-e-mag.com • A&E APRIL 2019 Call (618) 205 5007 Email sales@bofaamericas.com fume extraction solutions Market leading fume extraction technology for all types of print and laser processing, at affordable prices. aD oracle iQ reliaBle, HiGH QualitY solutions WITH LOW LIFETIME COST OF OWNERSHIP Duets Ultimates ™ . The engraving substrate for your most demanding jobs. GET TOUGH. Stand up to the toughest environments. 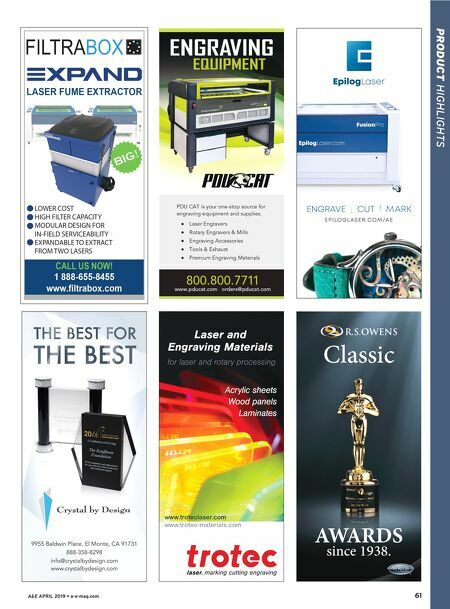 See for yourself with a FREE sample at DuetsByGemini.com/GetTough rolanddga.com/on-demand MASTER YOUR CRAFT Watch hours of FREE Roland training webinars on-demand Each month Awards & Engraving offers readers resources to enrich and expand their business with great products and services from our advertisers. Welcome to the PRODUCT HIGHLIGHTS section.